[Image: Matthew Cusick, The Course of Empire (Mixmaster II), 2006. Mixed media and maps on prepared panel; courtesy Lisa Dent Gallery. Photo by Wilfred J. Jones]. 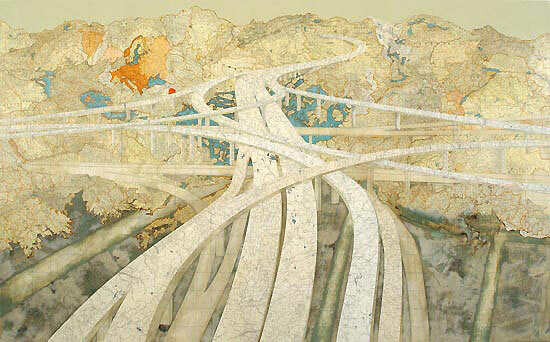 "Matthew Cusick's maps lead nowhere," Artkrush warns. His newest works depict "a series of Texas highways traversing allegorical landscapes" – a geography described by Cusick's gallerist as "layered with animal migration paths, trading posts, and railroad depots." The above work, along with two other highway paintings, is on display now at the Lisa Dent Gallery in San Francisco. um, i don't think those are paintings actually. they are collage, maps with maybe some paint thrown in? and surely the titles are references to cole? Well, they're "mixed media and maps on prepared panel," as the caption states. And the title is a reference to Cole - see the Artkrush review for more info. There are a few more shots of his work here. Those works look very interesting and I thought it would be neat to go see them since I am in SF.